lookups lookups derive Number of access vector lookups. This number is a good indicator of the load beeing placed on the AVC. hits hits derive Number of access vector hits. 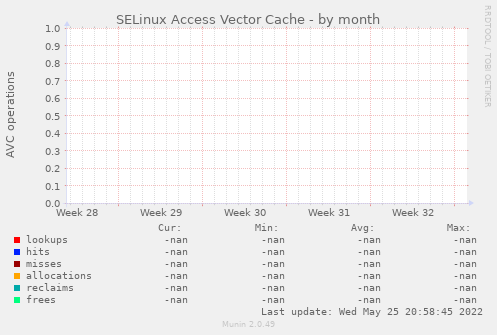 misses misses derive Number of cache misses. allocations allocations derive Number of AVC entries allocated. reclaims reclaims derive Number of current total reclaimed AVC entries. 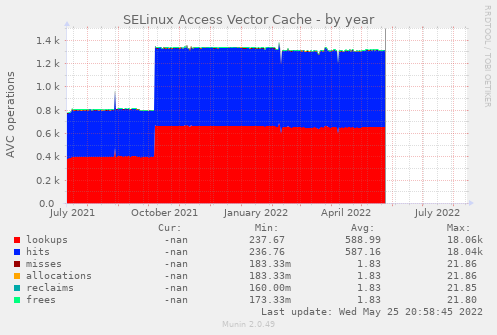 If this keeps changing, you may need to increase the cache size (/selinux/avc/cache_threshold). frees frees derive Number of free AVC entries.